Hey, that’s WATER! You can’t waste that stuff!! WOW! A Kindergartener just gave me the “what-for” about the importance of water conservation. IMPRESSIVE! This friendly little chat reminded me of a similar one I once had with my daughter who was horrified to learn that I intended to water the lawn. 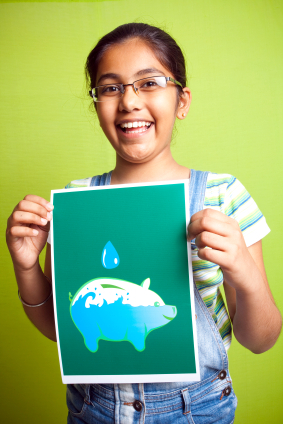 She, much older and wiser at a whopping 8 years old, shared a cautionary tale of how water is a “limited resource” and that “a pretty lawn is not worth the cost to the environment” (no joke – this happened). Hand me a backpack, I’m gettin’ schooled up in here! Sharing these stories makes me realize something – our kids get it! Clearly the educators in our schools are doing an excellent job in helping our little ones understand the importance of water conservation and other environmental issues. Really, this makes our job as parents kinda easy…all we have to do is walk the talk – role model good global citizenship and let them see and help us practise conservation. • Reinforce what our kids already know and make it fun to learn more about water conservation. • Live a lifestyle of responsible water consumption – your kids will learn to live that way too! • Find tips on how to reduce your water use, inside and outside your home, at www.halton.ca/waterconservation. • Become familiar with and follow Halton Region’s numeric, colour-coded outdoor water use restriction system. Got more great tips on how to be a water conservation role model? Do tell! We wanna hear them! This entry was posted in Children & Tweens, Parenting, Parenting Your Child/Tween, Parenting Your Teen, Parenting Your Toddler & Preschooler, Teens, Toddlers & Preschoolers and tagged environment, halton region, Halton water conservation, Outdoor water-use restriction, school, teach kids water conservation, Water, Water conservation, Water resources. Bookmark the permalink. 1 Response to Hey, that’s WATER! You can’t waste that stuff! !